Founded in 1911, Tsinghua University is a unique comprehensive university bridging China and the world, connecting ancient and modern society, and encompassing the arts and sciences. As one of China's most prestigious and influential universities, Tsinghua is committed to cultivating globally competent students who will thrive in today's world and become tomorrow's leaders. Through the pursuit of education and research at the highest level of excellence, Tsinghua is developing innovative solutions that will help solve pressing problems in China and the world. The Tsinghua campus, renowned for its beauty and historical significance, is situated on the site of the former imperial gardens of the Qing Dynasty, and is surrounded by a number of historical sites in north-west Beijing. 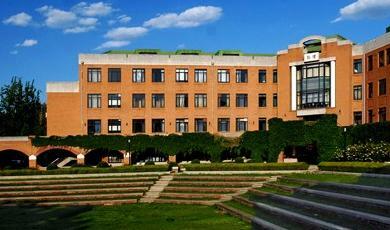 Tsinghua offers its students a superior learning, teaching and research environment. Its research and teaching facilities include one main library, six subject libraries, over 300 public classrooms and more than 300 laboratories and research institutes. Tsinghua is among the top research universities in the world. It has fostered many outstanding scholars, successful entrepreneurs, and distinguished statesmen widely esteemed at home and abroad. In the latest global rankings, Tsinghua University ranked 1st in the US News Best Global Universities for Engineering and Computer Science (2018). It ranked 17th in the QS World University Rankings (2019) and 30th in the THE World University Rankings (2018). Student life at Tsinghua extends far beyond academic courses. Athletics, performing arts, a vast array of clubs and societies, and diverse social activities not only complement a student’s studies at Tsinghua, but also offer wonderful opportunities for friendship and learning. The Zijing International Student Apartments of Tsinghua University provide three types of dormitory rooms to the international students: single room (private bedroom and bathroom), RMB 80/day; AB room (private bedroom, shared bathroom), RMB 80/day/person; double room (two beds in one room, shared bathroom on each floor), RMB 40/day/person. Included in each room are bedclothes, central air conditioning, Internet access and furniture. The apartments have a capacity of accommodating around 2000 international students. For more details of the apartments, please visit Zijing International Student Apartments. The General Reception Desk of Zijing International Student Apartments is in Zijing Apartment Building No. 19. It serves from 7:00 am to 23:00 pm. The service phone number: +86-10-5153 5501; Email: gaopei@tsinghua.edu.cn. Because the number of on-campus apartment rooms is limited and can not meet the demands of all students to live on campus, the new students who have received the Admission Notice of Tsinghua University need to book the rooms in advance, following the date, time and procedure specified in the Instructions of International Students Dormitory Application System of Tsinghua University which is sent out with the admission package. If you do not successfully book a room in the on-campus apartments, you need to arrange off-campus accommodation in advance. We are sorry that currently the University is not able to officially recommend off-campus housing information and housing agencies for your off-campus accommodation. According to the experiences of our international students, many of them prefer to live in the apartments near the campus, such as Huaqing Jiayuan and Dongsheng Yuan, etc. Some students choose to live far from the campus, because the rents might be much lower. You may need to ask some help from your Chinese Buddy or friends in Beijing. Please be careful when signing the contract or lease, since there may be hidden clauses. When you live off campus, never forget to get a Registration Form of Temporary Residence issued by the local police station of your accommodation. Within 24 hours after you move in, please bring your passport and go to the local police station together with your landlord (or other authorized agency). The Registration Form of Temporary Residence is another important certificate for your legal stay in China, aside from your passport and visa. Please keep it along with your passport. It is required for your application of new visa, visa extension, additional entry or residence permit. Therefore, a special reminder is that before you sign for the contract or pay for the rental, do confirm that the owner of the apartment/house property is able to process the accommodation registration for you. Otherwise you will get into trouble of illegal stay. Tsinghua Garden is architecturally unique. It preserves original architectural features over three centuries old. The garden retains a traditional Qing private garden design and style with painted corridors connecting every room. It has functioned as the university's head office for many years. Due to its distinctive characteristics, it has become a major attraction on campus. 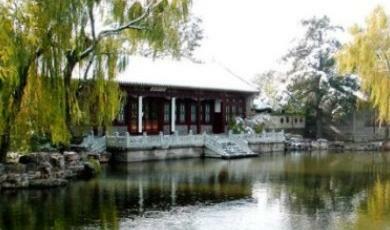 The more popular name of the garden is Gong Zi Ting -- which in Chinese means H-Shaped House. Viewed from above, the central part of the house resembles the letter "H", with its two halls in the front and back connected by a short corridor in the middle. The garden started out as the residence of a Qing emperor's brother's family. In the early days of Tsinghua School, founded in 1911, the garden was used as the school's first head office building. Student enrollment lists were posted on the wall at the front gate. For some years in its history, the east room in the front section was used as the Music Center, the west room as the teacher's reading room and the back section to accommodate distinguished foreign guests. The great Indian poet Rabindranath Tagore stayed there when he visited China in 1924. 1. Foreign citizens, in good physical and mental health, and awarded a certificate of graduation from high school. 2.1 High school/University (if applicable) transcripts (in Chinese or English). 2.2 Certificate of National/Regional Graduation Examination/Matriculation Examination. 2.3 Results of international standard tests (e.g. SAT/ACT/A-Level/AP/IB/others). 3.1 Chinese language proficiency of HSK Level 5 or above, with each subject scored over 60 points. Chinese language proficiency of HSK Level 4 (with each subject scored over 60 points) is eligible too, however, applicants must improve to Level 5 or above with each subject scored over 60 points within the first academic year in Tsinghua University. Students who do not achieve this will be required to leave Tsinghua University. Applicants whose native language is Chinese, or can provide proof of studying at a high school where the teaching language is Chinese, can apply for HSK test waiver in the Online Application System for further approval by Tsinghua University. 3.2 Good English language proficiency. For those whose native language is not English, please provide score report of English language test (e.g. TOEFL/IELTS/others). 4. Aged 18 or above (by September 1, 2019). For the applicants under 18, please bring the relevant supporting documents to the official registration. 5. For those who have given up their original Chinese citizenship and become foreign citizens, the conditions set by the Document No. 83 (2009) of Ministry of Education of the PRC should be met. 1.1 Create your account in the Online Application System. 1.2 Complete the application form during the application periods. 1.3 Upload the documents as required. 1.4 Pay the application fee (600 RMB) online and submit the application. Applications submitted with all the information correct and completed will be evaluated by Tsinghua University. Applicants who have passed the Application Review will be admitted to the interview. The method and time of the interview will be informed in advance. Applicants who apply for Design/Fine Arts programs in Arts Division will be asked for extra tests (Sketch, Quick Sketch, and Color Painting) held in Tsinghua University. Outstanding applicants recognized by Tsinghua University may have the interview waived and get an offer directly. The admission decision is based on a comprehensive evaluation of academic performance, language ability, supporting materials as well as interview (if applicable). NOTE: The method and time of each round’s interview will be informed in advance. In the academic year 2019-2020 Tsinghua University will offer more than 100 Master's degree programs and 80 Doctoral degree programs to International Students.17 Master's programs and 8 Doctoral programs are delivered in English. The University offers 81 undergraduate programs, 17 second bachelor’s degree programs and 15 minor programs, including but not limited to Science, Engineering, Business, Humanities, Law and Medicine. As a comprehensive research university, Tsinghua sets the standards for engineering education, excels in the liberal arts and science programs, and leads the nation in interdisciplinary education. The undergraduate programs of Tsinghua University are 4-year full-time study (except for the program in architecture which requires 5 years). The programs are mainly delivered in Chinese, with part of the courses taught in English or bilingually. Bachelor's degree and graduation certificate will be awarded if the student finish all the required course work and pass the thesis defense. Starting from 2017, Tsinghua begins to integrate programs/majors into divisions and recruit students of undergraduate programs by division. There are 15 divisions open to international students. Upon arriving at Tsinghua University, students from most divisions will undergo the general curriculum of their divisions in their first academic year. By the end of the first academic year, the specific programs/majors will be confirmed. In the second academic year, students enter the relevant schools/departments for major study. More than 100 Master’s and 80 doctoral programs are open to the international students. In particular, 27 Graduate programs as well as most of the doctoral programs in engineering and natural science subjects are delivered in English, providing more choices to the students who are not skilled at Chinese language. The admission criteria are based on the evaluation of the applicant’s academic background and research capability. Moreover, Tsinghua has established more than 40 Graduate joint programs in cooperation with foreign partner universities. Exchange/Visiting Programs: Tsinghua has established partnerships with more than 200 universities around the world, and student exchange has been implemented with more than 120 partner universities. The students exchanged from partner universities study in Tsinghua(take courses or do research) for one to two semesters and transfer back the credits to their home university. There are nearly 300 English-taught courses open to the exchange students. Meanwhile, Chinese Language courses are offered to help them learn basic Chinese. Chinese Language Program: The Chinese language program delivers Chinese language courses to the international students who are going to learn Chinese. The courses have eight levels, covering beginners and advanced learners. The curriculum includes Speaking, Listening Comprehension, Comprehensive Chinese, Extensive Reading, Newspaper Reading, Classical Chinese, Hot Topics, Writing, Pronunciation, Reading Aloud, and Discussion. In addition, some elective courses are also available, such as Chinese Calligraphy, Chinese Painting, Chinese Songs, HSK Lessons, Taiji, Chinese Martial Arts, and Chinese Er-hu, etc. Please refer to our website for more information about the program and application: http://www.tsinghua.edu.cn(home page of Tsinghua University)->English version->admissions->Non-degree Programs->Chinese Language Program. Application fee: RMB 600 for undergraduate, RMB 800 Master's and doctoral programs, RMB 400 for visiting and Chinese Language Program. 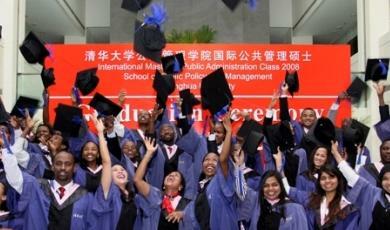 Doctoral programs: RMB 32,000-50,000 per year；Visiting programs: RMB 25,000-45,000 per year; Chinese language program: RMB 12,600 per semester. Medical Insurance Fee: RMB 600 per year. Accidental Injury and Hospitalization are covered. Accommodation Fee: On-campus dormitory: RMB 80 per day for single room and AB room, RMB 40 per day for double room. Because the number of on-campus dormitory rooms is limited, the new students who have received the Admission Notice of Tsinghua University need to book the rooms at specified date and time. If you can not successfully book a room in the on-campus dormitory, you need to arrange off-campus accommodation in advance. Tsinghua University mainly offers two kinds of scholarships to incoming full-time international graduate students: Chinese Government Scholarship (CGS) and Tuition Scholarships. Tuition Scholarships include Beijing Government Scholarship (for full-time master’s program students) and Tsinghua University Scholarship (for full-time doctoral program students). Tuition Scholarships cover full or partial tuition fee support with a duration of one academic year and could be applied year by year (competitive). The admitted students shall bring their personal and ordinary passport, Admission Notice, Visa Application Form (JW202/ JW201), and original Form of Physical Examination Record for Foreigners as well as other original documents of physical examination to the Chinese Embassy or Consulate and apply for student visa (X1 for study of more than 180 days, X2 for study of less than 180 days).